We went to visit Zoe at Mizzou this weekend. My favorite part of our visit was definitely going to see the Missouri State Penitentiary in Jefferson City. The oldest building on site was built in 1868. Our tour guide was a former corrections officer at the prison. The whole historical experience could be very jarring at times. One of the buildings we visited was built three years after Lincoln was assassinated, there were 1950s-esque fallout shelter signs outside posted on some of the walls, and we're standing and talking to a guy who still worked at the prison when it closed in 2004. Learning about the prison's various famous guests was an amusing part of the tour. This was boxing world heavyweight champion Sonny Liston's cell. He learned how to box while at the penitentiary. 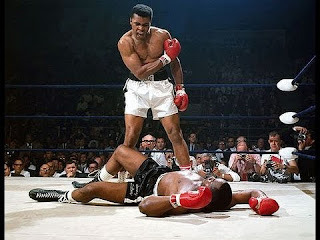 In this iconic photo of Muhammad Ali, the dude on the ground is Sonny Liston. I'd seen the photo a thousand times but had never actually watched the shady-looking fight. Sonny was widely accused to throwing the match so the mafia could make money betting against him. Some of the cells still featured prisoner artwork. They had a few cells set up to look like they did in different eras. In the 1800s a ten year sentence was considered to be a life sentence because it was unlikely you'd survive the disease, violence, and forced labor. A different housing unit had large fences separating the inmates from the windows. I figured it was to keep them from escaping but the fencing was there to keep inmates from throwing bars of soap at the windows to break them in the hot summer months. This cell housed the infamous James Earl Ray. Ray escaped from the prison in 1967 in the back of a bread truck and then in 1968 assassinated Martin Luther King. We got in our cars and drove to the gas chamber. That tall chimney on top is where they vented the cyanide gas after business had been concluded. The thing looked like an old submarine. One guy they killed here was so unaware of his predicament that he wrapped up some of his last meal to save for later. Our guide told us that the State of Missouri switched to lethal injection because they couldn't get the gas chamber to stop leaking.